Well I couldn't take the pace of kicking Invercargill so I got out of there fairly quickly (anyone who has been to Invercargill will sense my sarcasm). We headed on from there to Dunedin which is the Celtic word for Edinburgh. Perhaps stupidly, I was expecting a warm welcoming feeling from Dunedin because of this. I thought the familiarity of all of the street names like Princes' St and George St would make me feel at home. It turned out not to be the case. Dunedin has pretty parts like the railway station but it's no Edinburgh. Dunedin does however have some very good points namely the brewery and the Cadbury's chocolate factory. I couldn't decide what one to get more excited about. When we were there it was 'O week' which is basically freshers week. So we headed out to the student drinking haunts with all the 18 year olds. Boy did I feel old! It was fun though. We only spent a day in Dunedin before heading back to Queenstown. This time there was no extreme activities. I waved goodbye to the last of my Stray bus mates and fitted in some tramping and some shopping. On Monday I said bye to the South Island and headed to the North Island. I have heard it said many a time that the South Island is far more beautiful than the North Island but I have to say what I've seen of the North Island so far has been pretty incredible. I started off my North Island experience in Rotorua, an area of the North Island which has continuing volcanic activity and hence, geothermal features like bubbling mud baths and hot springs. Brian and Liz, some friends whom Susan and I met in China, had offered to let me stay with them and be my personal tour guides. I couldn't have better hosts and guides! We started off with Ta Puia which is Rotorua's largest thermal reserve and is also a Maori cultural centre. Getting to learn something about the culture was probably a bit overdue given I'd learnt nothing about it despite having been in NZ for 2 weeks. We visited a really great Maori museum which showed musical instruments, traditional Maori clothes and weapons. We also got to see some traditional Maori wood carving and finally and best of all watched a Maori show which took place in the Maori meeting house but only after the tourists were invited in and the invitation had been accepted by our chief, a guy from England. Rather him than me. The chanting and face pulling of the Maori people would have been enough to make me cry and run away in fear! I am however, glad that I braved the show because it was great. We made it along to the Pohutu and Prince of Wales' Feather geysers in time to see them erupting boiling hot water and steam about 20 metres into the air. We also saw a mud pool which was bubbling away with the thermal heat. Our last stop before leaving Te Puia was at the Kiwi house where I saw 2 Kiwi birds running about and playing. They are great little birds - I would have loved to pocket one and take it home with me but maybe I should learn to look after myself before trying to look after an endangered bird! We headed back to Mount Maunganui where Brian and Liz stay with some stops on the way to see some pretty lakes. All in all it was a great day. Now you aren´t going to believe the next bit. Feeling like I had been lacking in exercise after sitting on the stray bus for a while I had mentioned to Brian and Liz that I quite fancied doing the Tongariro Crossing. This is an 8 hour walk which is rated as one of the top 10 day walks in the world. Brian and Liz kindly suggested we get up early the next morning so we could drive there and do it together the next again day. Did Brian and Liz know me better than I thought and guess that if they never took me the chances are I wouldn´t get round to it on my own?? We got up the next day at 4am and left the house at 5am for the 3 hour drive to the start of the walk. When we got there the weather wasn´t looking great but we were told that it was due to clear up so we decided to do the walk. The start of the walk is relatively flat and quite enjoyable. Then you get to the Soda Streams and it starts to get steep on the climb to the South Crater and then the Red Crater. The climb was worth it when you saw the Emerald Lakes which are basically three water filled craters. The whole area is a thermal area and these lakes are a brilliant greenish colour caused by minerals in the thermal ground. Have a look at my pictures to see them. They are fab!! The walk carries on from there past some more craters, lakes and springs like the ones we had seen the day before. We made it to the end of the walk in about 6 and a half hours. I´m pretty sure in Edinburgh I don´t do that much walking in a week!! On the way back from the walk we stopped off for some dinner and ate it at the Haka Falls near Taupo. It is a gorgeous turquise blue coloured waterfall. Needless to say that night i was shattered. I had a nice sleep to recover from the walk and the next day Liz and I had a quiet morning, a trip to the shops in the afternoon, followed by a walk up Mt Maunganui (Liz & Brian´s local gym). From the top of Mt Maunganui you get great views of round about. Fab!! 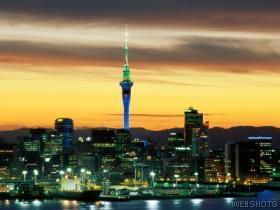 So that´s me done the central North Island and now I´m off to Aukland to see the capital. I´ve been there briefly before and it was very grey - fingers crossed the weather will be better for me this time!